Head back to the two way and go south, then north, west again, then south for a chest containing “Guiding Feather x2”. Now go north past the bridge then west until you see a three way fork and an entrance on the Mini Map, go north to the entrance for a chest containing “Strength Drop”. Go back to the three way fork and go southwest till you get a scene with Cynthia, Yusis and Laminah. After you gain control, head southwest to get a "Speed Orb." Then head north, then south, then north again till you see a healing fount since there is a boss on the next screen. I recommend being at least Level 10, having 100p on both Yusis and Cynthia’s weapon and 50p on Laminah’s weapon. 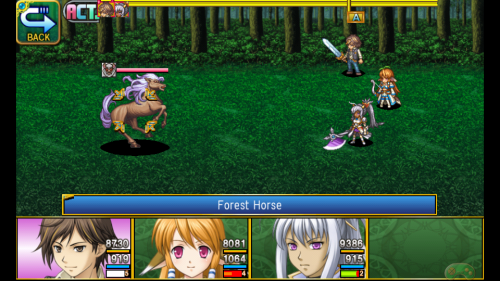 Strategy: Okay so Forest Horse is fast. It will almost every time get a turn before you, but it doesn’t matter since it has a low HP. Just use everyone’s strongest skill, and it will be dead long before it even uses its AOE skill. Dancing Warblade and Cinders and Ashes work wonders here. Missing 4 weapons, help please?